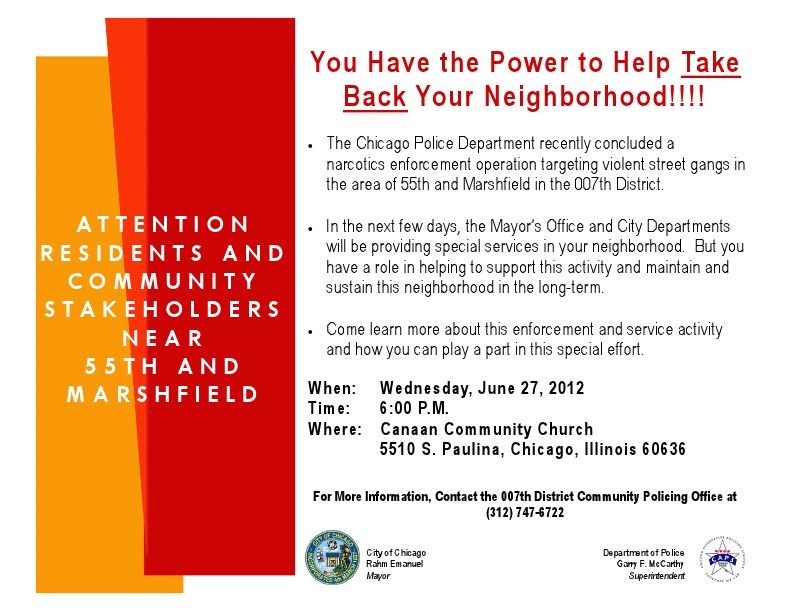 Take Back Your Neighborhood!! | R.A.G.E. The Chicago Police Department recently concluded a narcotics enforcement operation targeting violent street gangs in the area of 55th and Marshfield in the 007th District. In the next few days, the Mayor’s Office and City Departments will be providing special services in your neighborhood. But you have a role in helping to support this activity and maintain and sustain this neighborhood in the long-term. Come learn more about this enforcement and service activity and how you can play a part in this special effort. CTA Red Line, Health, Poetry & More In Englewood Tomorrow! !